What is the Project? Fire Emblem: The Elibe Duology Dub will be comprised of a cast dedicated to dubbing the entirety of the sixth and seventh installments of the Fire Emblem series, The Binding Blade and The Blazing Blade. Part I of this project will follow the seventh installment, The Blazing Blade, through Lyndis, Eliwood and Hector’s routes through the story. How Long is the Project? The Blazing Sword has 30+ chapters, with chapters 1-10 following Lyndis, and the remainder following either Eliwood or Hector. This project will cover all of these chapters in all routes, and will likely run through the better part of 2019. Auditions were originally set to close on December 29th, 2018 at 11:59pm MT. An extension has been placed until January 19th, 2019 at 11:59pm MT. THIS WILL BE THE FINAL DEADLINE. Casting of all roles will conclude as promptly as possible following the deadline in the form of a cast video. Roles will not be cast prior to this deadline, and casting will be extended if not all roles are able to be cast at that time. How Will the Project Be Released? The project will be hosted on our YouTube Channel. Chapters and supports will be edited and released on a regular schedule. 1) All actors must have a clear microphone and overall good audio quality! Avoid recording in large or echoey rooms, and rooms with air conditioning, fans, or other appliances running in the background. Pop filters or angling your microphone slightly to the side are also helpful to avoid unwanted noise, puffing, or popping. Be careful to avoid audio clipping and buzzing. Please don't use any vocal-altering effects, or any filters that might majorly change the sound of your audio! 2) This project requires a lot of emotion, so if you plan on auditioning, you should be able to shout, scream, yell, cry, or be as flexible as possible when it comes to your emotional range. 3) Many of these characters do not have official voice actors, so please pay attention to what sort of voice is preferred in the character descriptions. Matching the Japanese or English actors that appear in the Fire Emblem: Heroes mobile game is discouraged. We'd like you to bring your own flair to your performance, so long as it fits the character's personality and adheres to the given vocal description! 4) This project requires cast members to be 16 years of age or older. Please ensure that you do not audition should you be younger than 16 years old. 5) At least one session of live direction will be mandatory before officially recording for the project. This is to ensure voice consistency and that both the actor and director have a similar understanding of expectations! 6) Deadlines will be implemented upon having a full cast -- we will be expecting lines from all cast members once every two weeks! Checking your notifications for announcements regularly is a must. If you think that this schedule will be too difficult for you to adhere to on a regular basis, please do not audition. Amiti Productions has a deadline policy in place to keep our projects running smoothly. 7) A Discord account is mandatory so as to keep everyone up to date with proper updates and announcements. This is non-negotiable. 8) Be prepared for the project to take a fair amount of time, and potentially for a significant amount of lines. Should you think that you may not be able to dedicate yourself to this project for an extended period, please do not audition! By auditioning, you agree that you have read and will adhere to all of the above guidelines. Should you have any questions, comments, or concerns regarding the project, please feel free to reach out! More roles may become available as necessary! – The captain of a band of corsairs. A generous man. The captain of a band of pirates. Fargus is best described as a hearty and optimistic soul who, despite being a pirate, hardly fits the persona as one. He is deeply caring of the lords Eliwood, Hector, and Lyn, and even offered his help against Nergal despite all that the lords had related. The villagers of Badon seldom fear the pirates, even wishing that they were present when the Black Fang attacked. Voice: Low. Pirate like, compassionate, and hearty. – The founder of the Black Fang. Father of Lloyd and Linus. The original founder of the organization known as the Black Fang. Brendan originally founded the Black Fang in Bern to be a group of respectable mercenaries who would aid people in need. Brendan's group of good-doing mercenaries eventually grew to a huge number. In the process, a few shady characters were recruited purely for their combat prowess. Because of this, when Nergal learned of the Black Fang, he decided to use them for his own means, sending one of his morphs, Sonia, to seduce Brendan into marrying her. She succeeded in doing this, causing Nergal, little by little, to gain control of the entire Black Fang through her influence. Voice: Low. Considerate, fatherly, and strong. – A military commander of Bern. A humble military commander of Bern. When King Desmond poisoned Zephiel in an assassination attempt, Murdock was the one who nursed him back to health. Voice: Low. Dutiful, stoic, and stern. ✸ This character returns for Part II: The Binding Blade. Male extra roles can vary from bandits, lords, soldiers, and mercenaries to villagers or town elders. Female extra roles are typically villagers, clerics, or civilians. They could also be young boys. ✸ These extras will return for Part II: The Binding Blade. – A young girl from the Lorca tribe. Stouthearted and kind. One of the three main characters of our story, Lyn is the sole survivor of the Lorca tribe and heir to the throne of Caelin. From her humble origins in the plains, Lyn has been noted as a caring and kind-hearted soul. She rarely thinks ill of others and, despite the circumstances, always believes on the best of things. Her serene nature has earned her the friendship and trust of many of her companions. Voice: Medium. Straightforward, confident, caring. – Marquess Pherae's young son. Just and honorable. One of the three main characters of our story, Eliwood is the son of the Marquess of Pherae. Eliwood is a very friendly young lord who does not judge, but rather looks at others for who they are, and truly thinks of every one of his comrades as an irreplaceable friend. He often tries to be supportive regarding others' problems. On his journey, he is very determined to succeed for the sake of his father, and demonstrates most commendable qualities in a leader. Voice: Medium. Friendly, determined, dutiful. – Marquess Ostia's younger brother. Reckless, but loyal. One of the three main characters of our story, Hector is the brother of the Marquess of Ostia. Hector has quite a reckless personality, and is never afraid to speak his mind, often leaving him to sound rather blunt. However, he still cares greatly for his companions. He is quite enthusiastic about fighting and sparring, and trains very hard to improve his axefighting skills. Voice: Low. Resolute, impulsive, and reliable. A mysterious traveler who is found unconscious on the plains. Mark will be acting as the narrator for our stories. Mark is compassionate, gifted in terms of military strategy, and willing to go to any lengths for their friends. Everyone in the army respects the tactician greatly, offering suggestions and putting their faith in their orders. Voice: Medium. Compassionate, studious, and determined. “Once, dragons and men coexisted. They shared a peace forged in wisdom, a peace that lasted many generations. All that was lost when mankind disrupted this balance in a sudden onslaught. Man fought dragon in a savage war that shook the foundations of their world. This war was called The Scouring. Defeated and humbled, dragons vanished from the realm. In time, man rebuilt and spread his dominion across the land and on to the islands beyond. – A somber girl. Quiet, but filled with a solemn energy. A quiet, sweet, and beautiful dancer, and the older sister of Nils. She is also a half-dragon. Ninian is a gentle, polite, and courteous girl, treating all of the people she can support with recognition, respect, and courtesy. However, it is shown that she can also be very brave to protect those she loves. Her speech patterns are also very slow, meaning that she pauses and thinks a lot before she speaks, most likely out of shyness, as she is re-adapting to her old home in Elibe, or out of fear regarding other people. Voice: Medium to high. Shy, tender, and compassionate. – A bard possessing arcane powers. Brother of Ninian. A half-dragon that takes the form of a blue-haired boy, and one of the few dragons to survive The Scouring, along with his sister Ninian. Nils poses as a mysterious flutist accompanied by his older sister, the dancer Ninian. He is reluctant to trust others because of his mistreatment at the hands of those who do not want to be involved with the Black Fang's pursuit of both himself and his sister, but remains kind to his comrades. He is fiercely protective of Ninian. Voice: Boyish. Gentle, youthful, and sincere. – A knight in service to house Caelin. A bit of a scoundrel. A knight of Caelin, and one of the cantons of the Lycian League. He and his friend Kent were sent by the marquess to locate his granddaughter for him on the plains of Sacae. Sain is a jovial skirt-chaser of a knight who considers it his "curse" to be attracted to all women. Although he is a bit roguish, he is dependable and good-hearted. Voice: Medium. Carefree, mischievous, friendly. – A knight in service to house Caelin. Virtuous to a fault. A knight of Caelin, and one of the cantons of the Lycian League. He and his friend Sain were sent by the marquess to locate his granddaughter for him on the plains of Sacae. Kent is a stern, uptight knight who always follows the rules. In gratitude for his actions in aiding Lyn to reclaim the throne for the marquess, Kent is promoted to the rank of knight-commander of Caelin. Voice: Medium to low. Firm, loyal, and honest. – A pegasus knight earning her title. A friend of Lyn's. The younger sister of Fiora and Farina, as well as a close friend of Lyn, Florina is a Pegasus Knight-in-training from Ilia. Her pegasus steed is named Huey. Florina is very shy around the other characters, especially men and archers. She if often stuttering, but all the while being kind and considerate. She has quite a bit of determination, along with a desire to become more independent from others. Voice: High. Shy, sincere, and polite. – A youth from Pherae, in the Lycian League. Very social. A Pheraen archer who joins Lyndis’ party in the Taliver Mountains, and gives them the name Lyndis’ Legion. Wil is best described as a cheery and optimistic person, treating most, if not all, of his companions as a friend at the cost of formalities. He has an outgoing and extroverted personality, though at times it inadvertently causes him to grate on others. He is also noted as stubborn, but he can also be serious and protective of those he cherishes. Voice: Medium. Positive, enthusiastic, and willful. – A man from a small village in Bern. Fights for his wife. A mercenary originally working for a group of bandits to earn money for his injured wife's treatments. Dorcas is a reserved and silent man. However, he clearly loves his wife, Natalie, and is willing to go to almost any extent to get the money to treat her illness, even resorting to banditry. Voice: Medium to low. Curt, devoted, and determined. – A cleric in service to House Ostia. Headstrong and bold. A high-maintenance cleric who is a member of the St. Elimine Church, and believes she deserves praise from everyone around her. Due to her misfortunes as a child, Serra is seen as a high-maintenance, egotistical, and somewhat cowardly cleric with a rapid tongue. She is an irritation to many of her companions, but her personality is just a way for her to get attention, something she longed for as a child. In truth, she has a fairly fragile disposition. Voice: Medium to high. Cheeky, dramatic, and lively. – A young mage from Etruria. Charming, but uptight. A solemn, intellectual young man who is deeply devoted to his studies. He despises distractions, especially when they come from his former employer, the cleric Serra. Ever since he was accepted under Pent's tutelage at the age of twelve, Erk has been highly studious and, more importantly, values dogged perseverance even at the expense of his health, collapsing once as he had forsaken food and sleep to continue his studies. Erk's personality is characterized as being overly serious and pedantic as he is a particularly introverted and withdrawn individual. Voice: Medium. Polite, solemn, and studious. – A young hired sword from the Kutolah tribe. The son of the Silver Wolf, who is the chieftain of the Kutolah, a Sacaean tribe. He speaks only when the situation calls for it. As the chieftain’s son, Rath was revered as the child with the most potential in the village, and his achievements spread quickly. However, Rath was banished from his village before the age of four, however, due to a prophecy that said he must leave to help "stop the burning". Voice: Medium to low. Aloof, somber, and thoughtful. – A cheery thief. His casual demeanor belies his skill. An enigmatic thief, and later revealed to be a spy for Ostia. Matthew's demeanor is cheerful and optimistic at best, rarely ever set back by the current situations at hand. He usually tends to give sarcastic and joyful responses to most threats and conversations thrown at him, though he has his slip-ups in his personality. Voice: Medium. Casual, jovial, and sarcastic. – A traveling acolyte. Gentle and serene. A monk who follows the religion of Saint Elimine, and is deeply devoted to his best friend Raven. Due to his feminine appearance, he is often mistaken for being female. Lucius is very kind and gentle, often expressing the faith of Saint Elimine. He almost never conveys anger and tries to help others he deems to be suffering, sometimes at the expense of his own health. Voice: Medium. Serene, courteous, and thoughtful. – A retired knight of Caelin. Constantly testing himself. Previously, Wallace was the Knight Commander of House Caelin. Wallace is competitive and battle loving. He seeks out fighting and holds utmost confidence in his skills. He is proud of both his abilities and country to the extent that he seems arrogant. Yet, Wallace is also warmhearted and loyal. He believes he knows best for people, keeping their best interests at heart. Voice: Low. Spirited, confident, and dependable. – A paladin serving House Pherae. A skilled veteran. A senior knight of Pherae who serves in an advisory role to Lord Eliwood. As an experienced knight, Marcus is dedicated to his position and watches over Pherae's newest recruits. He is a strict teacher, but does not discriminate against any soldier. Voice: Low. Steadfast, loyal, and stoic. – A knight in service to House Pherae. A fresh recruit. A fresh recruit of the Pheraean army, whom Marcus chooses to train personally. Lowen is a very gentle but insecure person, who constantly berates himself despite possessing a lot of talent in both sword fighting and cooking. Nonetheless, he is incredibly determined as well, and does not let his shortcomings get the better of him. Presumably, he is the army's cook, and is quite obsessed with staying full since he comes from a very poor village – even keeping emergency rations in his pack, in case he goes hungry while on the field. Voice: Medium to low. Gentle, unsure, and thoughtful. – A youth from Pherae. Very helpful and bright. The daughter of a village magistrate in Pherae and childhood friend of Wil. She is a sweet girl in search of her long lost brother. Rebecca is tomboyish, helpful, bright, and enjoys cooking. She can be rather bold, and possesses a mostly outgoing personality. Voice: Medium to high. Cheerful, kind, and sociable. – One of Eliwood’s guardsmen. Duty is everything to him. Bartre is very rash and reckless, but good-hearted. He also shows a lack of education. Bartre often promotes rigorous exercise, and will encourage people to hit him as hard as they can. Voice: Low. Rash, heartening, and gregarious. – A knight in service to House Ostia. Hector’s sworn man. A Knight of house Ostia sent by Lord Uther to accompany Hector and to keep an eye on him as he goes out to investigate the disappearance of Elbert, Eliwood's father. Oswin's loyalty to house Ostia is unwavering, and despite his high position in the Ostian military, he is not noble-born, so he worked his way to the top. Voice: Low. Dutiful, stern, and loyal. – A youth from Sacae. Yearns to be a swordmaster. A confused swordsman from Sacae's Kutolah tribe who wishes only to be the greatest sword wielder in the world. Guy will do what he has to do to survive. He is very jumpy and stutters often. While living in the village of his tribe, Guy had heard stories of the village leader's son, Rath, but he had left the village sometime before. Voice: Medium. Outspoken, confident, and energetic. – A traveling merchant. Timid and easily frightened. Merlinus is a merchant residing in either a tent, carriage, or wagon, and has no means of fighting. He holds the armory during each battle and also manages the supply convoy. As a person, Merlinus is rather shy, cowardly and quirky, but also very kind and ultimately loyal. Voice: Medium to low. Eccentric, cautious, and amiable. – A vassal in service to Count Caerleon of Etruria. A Troubadour born in the Cornwell clan of Ostia, who was adopted by Count Caerleon of Etruria as a child. Priscilla is extremely polite and a bit feminine. She is quite selfless, but also naïve and stubborn, much to the chagrin of those who care about her. She is a helpless romantic. Voice: Medium to high. Kindhearted, caring, and refined. – A troubled mercenary with a grudge against House Ostia. A hard-eyed Mercenary. He harbors a deep grudge against house Ostia. Previously known as Lord Raymond of Cornwell, a house destroyed by Ostia for corruption, Raven is the brother of Priscilla. Raven is cold, distant and fairly anti-social. Voice: Medium to low. Cold, aloof, and stern. – A scholar, and a novice student of ancient magics. A man on a quest to gain knowledge. Canas is a passionate scholar who has a tendency to read on the battlefield. Knowledge of the ancient magics has been passed down in Canas’ family for generations. His curiosity knows no bounds. Voice: Medium to low. Studious, inquisitive, and proper. – One of Fargus’ corsairs. Foulmouthed, but kind. Dart is one of Fargus’ companions. He is extremely loyal to those he puts his trust in. Previously washed up on the shore, Captain Fargus and his crew picked him up. He became an amnesiac, was given the name Dart, and soon became Fargus' most trusted mate. Voice: Medium to low. Brave, likable, and unrefined. – Commander of the 5th wing of Ilia’s pegasus knights. The honorable commander of the 5th Wing of Ilia's Pegasus Knights. Fiora is also the older sister of Farina and Florina. Fiora is dutiful and responsible to a fault, often compromising her own safety to help others and fulfill her duties. She hates to admit her inability to complete every task alone. As expected of a knight of Ilia, she is deeply loyal to her homeland, and is also overprotective of her youngest sister, Florina, whom she still views as a little girl. However, she is on rather poor terms with Farina, who left their family after an argument between them that occurred several years prior. Voice: Medium to low. Devoted, amiable, and independent. – A former Black Fang once known as Hurricane. A fugitive of the Black Fang, who chose to abandon the organization and become a Thief instead. Legault had been a member of the Black Fang organization since its inception. He is said to be second in ability to none except the Four Fangs, implying he had earned himself quite a reputation while he was still a member. He has many regrets. Voice: Medium to low. Polite, contemplative, and charismatic. – A paladin in service to House Pherae. Modest and polite. A female Paladin in service to house Pherae. She is a steward to Lord Eliwood's mother Eleanora, and remained in Pherae with her until she was told to aid Eliwood. Isadora is a daughter of a noble family and the only female among the knights of Pherae. She is modest and dutiful. Voice: Medium to low. Loyal, committed, and humble. – A deserter from Bern’s wyvern riders. Prideful. A proud Wyvern Rider of Bern who is honorable with a strong sense of justice and morality. Heath has a strong sense of personal honor. He has a high respect for chivalry and cares deeply about those who he fights with, not wanting to see his allies hurt. Voice: Medium. Considerate, charming, and ardent. – The protector of Nabata. A mysterious air surrounds him. A protector of the Nabata Desert. He is gruff and quiet, but is extremely loyal to Pent and Louise. Hawkeye is best described as quiet and introverted, speaking little to most of his companions. However, to Pent and Louise, he speaks his mind more often. He is also less reserved with Ninian, who resembles his daughter slightly. Voice: Low. Reserved, mysterious, and gruff. – The eldest son of a wealthy merchant. Finding himself. A tough-as-nails warrior embarrassed by his past who wishes to make his own destiny. Geitz was born to a merchant in Belger. He and his family helped the people of Ilia when their crops died during the winter. As a child, he ventured into the hull on his father's ships to see children and slaves rowing the boat. Ever since then, he hated his father and broke all ties with his family. Voice: Low. Supportive, gruff, and solemn. – Marquess of Reglay. Sole student of Archsage Athos. A sage living in the Nabata Desert with his wife Louise and his teacher Athos. He is actually Count Reglay of Etruria, and a legendary Mage General of Etruria. Pent is portrayed as an odd noble. He is, in fact, almost completely absent from his post in Etruria, absorbed in his studies and his role as Athos's student. Even more odd is his choice of wife in the sniper Louise, a woman who is neither of a high noble origin or skilled in courtly pursuits. He chose her among many other women because she admitted not being a skilled dancer or singer, but boldly offered to protect him with her bow and arrows instead. Voice: Medium to low. Polite, charismatic, and studious. – The wife of Marquess Reglay. A lethal beauty. The beautiful wife of Pent, Count of Reglay of Etruria. She is also the distant cousin and close friend of Queen Hellene of Bern. Louise is somewhat childlike in nature, but can be overprotective as well. She is also sweet, strong-willed and focused. Voice: Medium to low. Sweet, enchanting, and resolute. – An eastern swordmaster. Seeking worthy opponents. A Sacaen swordmaster known as the battle-crazed Sword Demon. Voice: Medium to low. Unwavering, intense, and hardhearted. – A dedicated swordfighter. Cool and detached. The emotionally distant, naive and cool-natured sister of Karel, known as the Princess of Swords. Although she has mastered the art of swordplay, she generally dislikes fighting and often finds peaceful methods of resolving conflict. She fights in arenas in hopes of finding her brother. Even after she finds out that he killed their parents, she strives to redeem him, or die trying. Voice: Medium to low. Aloof, calm, and determined. – The sole survivor of the Knights of Pherae. Harken is a knight in service to house Pherae of Lycia. On a mission accompanying Lord Elbert, he becomes the last survivor of his knights. After the Black Fang's attack on his group, he decides to take revenge by infiltrating their ranks and destroying them from within. His suicidal tendencies are only matched by his self-worth troubles coming from his blurry background and his love for his fiancée, the paladin Isadora, who he promised to marry once the war was over and he returned. Voice: Low. Firm, solemn, and steadfast. – One of the Black Fang. True and innocent. Nino is a young mage with an exceptional talent for magic. Despite being woefully under-trained, Nino is clearly a natural genius at the art. Although illiterate as well, and never having been formally trained; she instead learned by memorizing the incantations that Sonia chanted. Despite being neglected and hated by her foster mother on several occasions, Nino has retained a sense of loving optimism and deep caring to those in need. She rarely receives compliments and treats them and those who give them with great respect. Voice: High, girlish. Caring, sincere, and tenacious. – The Black Fang’s Angel of Death. Once served Nergal. Known as the Angel of Death, Jaffar is an emotionless killer in the employ of Nergal until he is changed by the kindness of Nino, the first person he ever came to care for. As a result of his upbringing by Nergal, Jaffar is initially emotionless, ruthless, and willing to kill in cold blood. He begins to change when Nino discovers him near death, and she defies the code of the Black Fang to aid him, in turn saving Jaffar's life. Voice: Medium to low. Cold, unfeeling, and severe. – A member of the 3rd wing of Ilia’s pegasus knights. A famed member of the 3rd Wing of Ilia's Pegasus Knights, Farina is also the middle sister of Fiora and Florina. Farina appears to be miserly and crude at times, but she does care deeply for her friends and family. She is very greedy and seems to be obsessed with money. She also has a high opinion of herself, as she believes that she is the finest mercenary that can be bought with money. Voice: Medium. Rough, stubborn, and overconfident. – A deserter from Bern’s wyvern riders. Brutal. A brutal general of Bern, who ends up deserting after a disastrous attack on Eliwood's army. Vaida is incredibly vain and arrogant, always claiming herself superior to others and referring to herself as "The hope of Bern". Even if the odds are placed unfavorably in the enemy's favor, she claims that she will prevail despite the circumstances. Despite her vanity, however, she carries a deep loyalty to the royalty of Bern, Zephiel in particular, and places her comrades and Bern above everything else, even her honor. Voice: Low. Cunning, proud, and unyielding. – A cleric wandering Valor. Shrouded in mystery. A Bishop of the St. Elimine clergy seeking to atone for his sins in the past on Valor. Renault's personality has dramatically changed throughout his long lifetime. He is greatly enigmatic and introverted, choosing to reveal his past to a select few. He is not an emotionless shell, as what is first perceived. He views his past with great regret. Voice: Medium to low. Proper, mysterious, and reserved. – An archsage. One of the eight legendary heroes. One of the Eight Legends from The Scouring framed by future generations as the Archsage. He is incredibly old and is a master of all forms of magic. As one of the Eight Legends, Athos helped to drive the dragons out of Elibe during the Scouring. After this war had passed and Elibe was divided into its different territories, Athos secluded to the Nabata desert. One day, as Athos charted the desert, he discovered a sanctuary where surviving dragons of the Scouring – most of whom were Divine Dragon refugees – and men lived in peace with each other. Athos wished to use the knowledge he'd acquired to expand this dragon-human paradise across Elibe, while his old friend Nergal’s path in knowledge differed, and led him to learn how to steal another being's life force, or quintessence, and turn it into power. Voice: Medium to low, grandfatherly. Studious, temperate, and reserved. – Marquess Laus. Power-hungry and spiteful. The power-hungry marquess of Laus, the first major antagonist during the first arc of Eliwood's and Hector's tales, and the father of Erik. Darin is noted by the citizens of Laus and by his son, Erik, to have been a bit arrogant, always claiming that Laus should be the strongest of the Lycia territories, but always kept a cool head and never dared speak, much less conspire open rebellion. Unfortunately, Ephidel preyed on that weakness, and Darin was manipulated, becoming a cold, heartless, and power-hungry noble, claiming himself the new leader of the world. Voice: Low. Gruff, arrogant, and spiteful. – The White Wolf. One of the Four Fangs. A skilled swordsman belonging to the Black Fang. He is the older of Brendan's two sons. He is also a member of the dreaded Four Fangs, the most powerful members of the Black Fang. Unlike his younger brother, Lloyd is calm and composed, willing to take any order that his father gives, even if he does not like the grip that Sonia has taken on the Black Fang. Voice: Low. Composed, loyal, and unyielding. – The Mad Dog. One of the Four Fangs. The younger son of Brendan Reed, the brother of Lloyd, and one the Four Fangs. He does not trust Sonia and her influence in the Black Fang, though he is very fond of her daughter, his stepsister Nino. Linus is best described as rash, impulsive, and extremely loyal to his siblings and loved ones. He shows deep respect to his brother, abiding his orders, though seems to be wrought with grief after his death and loses the ability to reason. Voice: Low. Impulsive, devoted, and tough. – The Blue Crow. One of the Four Fangs. One of the Four Fangs, sent out to kill Eliwood, who is later resurrected as a morph by Nergal. Ursula is unique amongst the Four Fangs, as she is the only one who specializes in magic. She is an extremely devoted member of the Black Fang, seen as a cold, heartless assassin to her targets. She never hesitates to coldly remind those under her the punishment for failure, and expresses little concern for any members of the Black Fang, with the exception of Sonia, whom she worships. Voice: Medium to low. Cunning, alluring, and cold. – A powerful morph serving Nergal. Terribly narcissistic. A morph created by Nergal, who also functions as Nino's adoptive and neglectful mother. Sonia sees the vast majority of humans as inferior, calling them "waste" and "human refuse", and is a morph, though she believes otherwise. She has deluded herself into believing that she is human and was selected, rather than created, by Nergal. She holds her fellow morphs in contempt and believes herself to be a "perfect being." Voice: Medium to low. Manipulative, alluring, and vain. – A powerful morph serving Nergal. A collector of quintessence. The most powerful of the morphs created by Nergal. They bear an impassive nature, and are totally loyal to their master. Limstella seems indifferent to almost everything, and acknowledges that any emotion they may seem to feel is only a construct. They seem to lack the same sadistic nature found in the other morphs, and only seeks to harm those whom they are directly ordered to attack. Strangely, despite being the most powerful morph, Limstella also seems to be the most docile. Voice: As Limstella is genderless, they may have a medium to low female voice, or a medium to high male voice. Distant, emotionless, and calm. – A powerful morph serving Nergal. A master of manipulation. A morph created by Nergal through magical means. He is rarely seen to express emotion, and is likely among the morphs that cannot feel. Ephidel matches most morph behavior as emotionless and calculating. He seemed to have some expectation of protection by Nergal. Voice: Medium. Scheming, emotionless, and mysterious. – An avaricious fiend who turns death into power. The main antagonist. He wields the strongest dark magic tome, Ereshkigal. Nergal and Athos once drifted apart in their beliefs. Nergal discovered a magic that could take the life force, or quintessence, of other living creatures and turn it into power. He began experimenting with small creatures, and as he grew more confident he used this same technique on ever more complex animals, eventually taking the life of a human. Athos and the village elders discovered Nergal's secret deeds and urged him to stop, but Nergal would not listen. Athos and the Divine Dragons managed to strike him down, and Nergal was banished from Arcadia. He vanished and slowly built up his power again to avoid the eye of Athos. 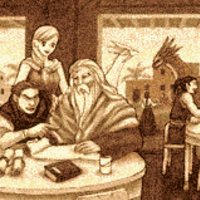 Nergal is the father of Ninian and Nils due to his relationship with the ice dragon Aenir. He sent his children through the Dragon's Gate on Valor to protect them when his wife was kidnapped, and afterward attempted to turn to dark magic to make himself stronger, in order to reclaim his children. However, Nergal lost himself in darkness in the process and was overcome with a lust only for power. Voice: Medium to low. Cunning, malicious, and insatiable. – A spy in service to House Ostia. A spy from Ostia, serving under Hector. She had a lasting relationship with a fellow spy, Matthew. Leila can be best be described as the perfect example of careful and cautious spy, keeping a silent aura about her and leaving herself unnoticed, easily blending into the Black Fang's organization for quite some time. She was able to mingle with most of its members and retrieve the information that aided the lords greatly on their missions, showing that she was able to keep a collected and calm mind in the fortress of the Black Fang. Despite this, she also is shown to have the same sardonic and optimistic attitude that Matthew retains, showing that the two are very similar in terms of ability and personality, though they go about their job in different ways. Voice: Medium to low. Positive, bold, and thoughtful. – The wife of Marquess Pherae. Eliwood’s mother. The wife of Lord Elbert of Pherae, and the mother of Eliwood. She is gentle and beautiful, but also has a rather strong will. She is said to be an excellent dancer. Voice: Medium to low. Motherly, devoted, and affectionate. The father of Eliwood, the husband of Lady Eleanora, and the Marquess of Pherae. He disappeared, along with many of the knights of Pherae, while investigating an unknown issue. His son soon sets off to find him. Lord Elbert was seen to be a just ruler and a kind man. His son and wife loved him dearly. Voice: Low. Fatherly, dedicated, and good-hearted. – Marquess Ostia. The older brother of Hector. The strong-willed older brother of Hector. He became the marquess of Ostia after their parents died from a sudden illness. He overtaxed his body managing the many affairs of Ostia, and trying to control Hector and prevent him from doing dangerous and reckless things. He became more like a father to Hector, despite Hector's many protests against Uther's overprotective behavior. However, Uther later began to suffer from an illness similar to the one that had killed their parents. Voice: Low. Gruff, committed, and responsible. – The King of Bern. The king of Bern and the father of Zephiel and Guinivere. Desmond was married to Hellene of Etruria, Zephiel's mother, but this marriage was forced on him for political reasons when he had wanted to marry an unnamed commoner, who later became his mistress and Guinivere's mother. Described as a man of average skill and intellect, as well as a tyrant, Desmond viewed Zephiel as emblematic of his hated marriage to Hellene. He believed Zephiel was plotting against him, despite his son idolizing him and only wanting to make him father proud. This was heightened by Desmond's jealousy of his gifted and well-liked son. He favored Guinevere fiercely. Voice: Low. Paranoid, harsh, and tyrannical. – The Queen of Bern. The wife of King Desmond of Bern and the biological mother of his successor, Zephiel. She is the Queen of Bern, though she originally hails from Etruria. She and Desmond were ill matched in their arranged marriage. Hellene used to be a very kind girl before getting married, but her long-time suffering as the Queen completely spoiled her formerly sweet disposition. She comes off as a superficial and possessive woman who appears to be obsessed with Zephiel's succession to the throne of Bern. Voice: Medium to low. Scathing, shallow, and graceful. – The Prince of Bern. The Prince of Bern, and son of Desmond and Hellene. Zephiel is a very gifted child. However, his spiteful and paranoid father, King Desmond, tries to stop him from taking the throne, wanting his favored daughter Guinivere's future husband to rule instead. Despite this, Zephiel and his half-sister, Guinivere, love each other dearly. Zephiel is an idealistic and talented youth wanting nothing more than his parents to reconcile, and peace in the world. Voice: Medium. Youthful, aspiring, and genuine. – The Princess of Bern. The half-sister of Zephiel and the princess of Bern. Her mother was King Desmond's mistress. She is shown to get along with her brother and her father well. Being very young, she doesn't appear to notice any animosity and is a happy child. Voice: High. Childlike, cheerful, and loving.